The new Dolphins offense is going to be more diverse. Today (one day) we saw motion, tight end screens, a reverse, a little read option -- and the Dolphins were only working in the red zone. (And not one go or go-go heard all day). So things are going to be interesting for the 2014 Miami offense, as has been well chronicled. But the defense is undergoing changes of its own as well. "We're always looking to improve," defensive coordinator Kevin Coyle said. "We take the offseason and study teams around the league. We look at ourselves. We look at ways we can be better and utilize personnel better. "We'll do some different things come the Fall, but I'm not going to talk about them with you guys." 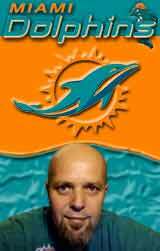 Well, some of the things the Dolphins are experimenting with are apparent. The team is giving Koa Misi the middle linebacker repetitions this offseason while Dannell Ellerbe is shifting to strongside linebacker. The experiment continues and has been something of a success in the offseason, but Coyle stops short of saying it will be what the Dolphins do in the regular season. "Right now, I can't commit today that it's a done deal," Coyle said, "but certainly I like what we're seeing." Coyle, speaking for the first time since the end of the 2013 season, made a prideful case for the quality of his defense. "We have a great foundation that we've built here. We feel real strong about what we've done," he said. "The bottom line is if you ask any defensive coach or head coach or anybody that really understands football for that matter, the bottom line is keep the points off the board. "We've been very good at that the last two years. We finished seventh in 2012, eighth in 2013. There's only been four teams in the league that have been in the top 8 --San Francisco, Cincinnati, Seattle and us. We've been third in the AFC for two consecutive years in scoring defense. So the bottom line is keeping people out of the end zone and giving yourself a chance to win." The Miami defense was playoff caliber before Coyle arrived. Nothing against him. He's a good coach. He's a good man. But he's not a historian. The problem is I'm partly a historian. The truth is the same Dolphins defense that was No. 8 in scoring defense (20.9 points per game) in 2013, and No. 7 in scoring defense (19.8 PPG) in 2012, was No. 6 in scoring defense (19.6 PPG) in 2011. So, ahem, the defense was already built to high standards before Coyle arrived. And that defense the past two years has gotten worse results, not better, if the standard is points allowed -- the statistic Coyle points to as the one football people think most important. Also, the idea of talking of how great the defense is should recall two more things: On Nov. 15 of last year, the Dolphins lost to the Buffalo Bills. On Dec. 23 of last year, the Dolphins lost to the Buffalo Bills. The Bills averaged 21 points in those two games. With Thad Lewis as their starting quarterback. Misi at MLB and Ellerbe at SLB is something I wanted to see, Wheeler was awful last year at SLB, I think Ellerbe is more suited to SLB in our D and I have always thought that Misi was an ILB since before he ever took a snap with the Fins. One thing is for sure, the LBs needed to be fixed, hopefully we can find the right combination for that unit. The linebacker play is going to be HUGE to the success of this defense. As a unit they really struggled last year. Like you said, the changes that the Dolphins made in regards to switching personnel around will be interesting to see how things develop. Interesting...the defense does give up a ton of chunk yards though. Those third and longs last season made me cringe. It was to the point that opposing offenses had a better chance of converting 3rd and 15s on us than 3rd and 1s. The Miami defense was playoff caliber before Coyle arrived. Can that EVER be the other way around? Smh.